Why Are We Giving Him a Hard Time? Since returning to the US, it seems the news is filled with criticism for President Obama. In a subtle way, it almost sounds as if people are blaming him for the high unemployment. They are holding him accountable for the amount of people out of work because he has not created enough jobs. Looking at the big picture, you have to wonder if any politicians are committed to fixing the economy or if they’re busy playing the blame game. So who’s to blame? President Obama because inherited an economy that was in a downward spiral? For Obama, it is analogous to a sinking ship. What are the choices when the ship is as it’s going down? You can jump ship. You can use buckets to throw the water overboard while the water is coming in at a faster rate. Or you can patch the hole. Obama hasn’t bailed. He has tried to create jobs, however, entire industries were collapsing around him. The economic landscape was changing, and even if he had created jobs in the beginning, people would still be out of work as their entire industry sunk. Unemployment levels were rising faster than we could hand out jobs. You have to start at the source of the leak, and patching the hole in our economy does not happen over night. When you have a sinking ship, you would have to make many tough choices and incredible sacrifices. Where do you devote your resources? Do you save lives or worry about temporary damage to the contents of the ship? In the case of the economy, once the cargo, in this case, the industries in danger are secure, they can go back to a stable growth mode. The ship can continue on its way. Additionally, while Obama needed to be sure these industries grew, it seems apparent that additional regulatory policies had to be put in place to avert another economic crisis. Even if that regulation risked destabilizing some of their growth. It was necessary to patch the hole so it does not open again. We’re now in a testing phase, patching the holes and seeing if the cork we used was the right size. While I believe the President took appropriate measures to fix the economy, it does not mean I agree with everything. He should be careful about additional taxes for the people who create jobs in this country: business owners. As a business owner, if I am willing to risk my resources – time, money, effort and family – why should I be penalized? We live in a country where people who make the greatest effort reap the greatest rewards. It’s the American way. Imagine if the person who trains the best and wins the gold medal in the Olympics is told they have to give up their medal to the less fortunate. Who would want to win the gold? Whether accumulating wealth from trading stocks or owning a business, allow us to benefit from our expertise. Entrepreneurs and those growing businesses should be rewarded and encouraged most of all. As we gain, we eventually need greater support from others. Let us distribute the wealth to others who have developed an expertise. What do you think? I would love to hear it below. Trading taxi cabs for four wheelers. I am writing this on a 6:00am flight that is leaving Suriname and returning to NY. I experienced so much this week that I am unsure of where to start. 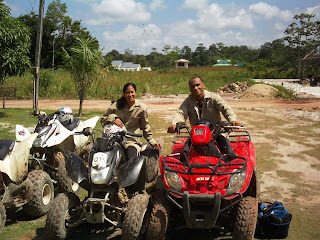 Over the past week, I spent 2 hours riding a 4-wheeled motorcycle through the Amazon. See photo. Afterwards, I swam in a river that separated me from the piranhas with a thin mesh net. I attended three birthday parties: one for a 70 year old, another turned 50 and the third turned 45. I also attended another Hindustan wedding. The wedding was for Ellen’s best friend. She and I left the reception at 4:00am. However, it continued until 6:00am. And it was outside. Did I mention the DJ played the music quite loudly? I walked across a very high and long bridge that clearly was not made for walking. It is for motor vehicles only. And most of the days during this activity the temperature was easily above 100 degrees. Two birthday parties were for Javanese women. The third was for a Hindustan man. The party for the 50 year old woman was a unique experience for me. There was an ensemble that played with wooden instruments made from bamboo. I have never seen these instruments before. The sound was incredible. In addition, there were a couple of women who performed traditional Indonesian dances. And the food only enhanced the experience. There were a wide variety of Javanese dishes. Unfortunately for me, all communication was done in Dutch or Javanese. Ellen was my translator for Dutch. A few days before Ellen’s aunt’s 50th birthday party she and I took a day trip to a part of the country called Nickcarie. It is the rice district. During the 3 ½ hour drive to get there, I saw a completely different terrain. As a rule, Suriname has many large rivers that are connected to lots of streams and smaller rivers. As a result, it is ideal for growing rice. Nickarie is the place where most of the rice grows. I saw millions of acres of rice growing in perfectly flat land. While in the rice district, we stopped at a market and bought fruits. There I had a few fruits that were new to my taste buds. Without question, the rice district is filled with small towns. However, you get the feel of any city while at the market. When you arrive in the parking lot it is filled with cab drivers hustling for a buck. They are clearly not shy to offer you a ride. They are all very persistent. While I know I have responsibilities that I enjoy waiting for me in NY, it was great to get away and barely think about business. I loved eating delicious foods that I have never tasted. I had a couple of incredible fruits. And I truly enjoyed the food from Indonesia. Seeing Ellen and being shown new lands for both of us was an added pleasure. She will be back in NY a few days from now. As you are reading this, I will be back in the office. If you have questions about Suriname or want me to write on a specific topic, connect through the comments. I am staying in a city called Lelydorp. It is the second largest city and the birthplace of my girlfriend, Ellen. Paramaribo is the largest and the capital. Lelydorp has a very large population of descendants from Indonesia. They are from the island Java, they are called Javanese. They brought their culture and food. Lelydorp is known for their warungs. You havent’t experienced Lelydorp if you haven’t stopped at one of these. At first sight, they look like stands serving food. When you get closer, you see that they have a kitchen, running water, electricity, and even a roof. Except, you may see five or six of theses clustered together under one roof. The food is very good. As you can imagine, in a country with such a small population, everywhere you go there is a small town feel. In fact, everyone who knows Ellen has already heard that I am in town and I only speak English. So when I speak a few words in Dutch, they all laugh and look at her and ask if can I understand everything in Dutch. Those who don’t know Ellen assume I am from here and approach me in Dutch. Take away the language and I fit right in. Oh, and I forgot to mention something. While the amount of English spoken will make the average American comfortable, they drive on the wrong side of the street – ha ha. The steering wheel is on the right side of the car. I have not driven a car here. However, even riding a bicycle requires an adjustment for me. Speaking of which, Ellen and I rode bicycles and she took me through back roads. What a sight! There are streets where people have built houses and roads in the jungle. The tall exotic trees, plants, animals and people are a sight to see. To add, the people are very friendly. Don’t forget when greeting a person you know, you kiss 3 times on the cheeks – alternate. The other thing I find interesting in Lelydorp is the demographics of the neighborhoods. If the average house is about 1,500 square feet, you will see right next to that home an 8,000 square foot home that is fenced in as though a celebrity lives there. It looks like it was pulled out of Beverly Hills. I have yet to see a neighborhood of 8,000+ square foot homes. 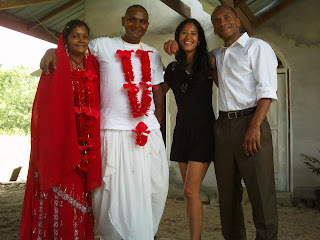 This past Sunday Ellen and I did visit a beautiful home where we attended a Hindustan wedding. From what I saw, the traditions that originated from India are still practiced here. It is an example of how people retain language in culture even though they are in a very diverse society. See photo of wedding. As you are reading this, I will be exploring the diversity of Suriname. I will be touring the Amazon on a four-wheel motorcycle. In the meantime, I have to go. I promised Ellen I would be here on vacation, not a working vacation. At the same time, can you really leave home without the Blackberry and laptop? If you have questions about Suriname in the meanwhile or want me to write on a specific topic, connect here through the comments. My girlfriend and I far from the concrete jungles. Without question, I escaped the merciless hurricane called Irene that attacked the Northeast. It seems like I took the easy way out. Except, I made my plans months ago. I am in a Dutch speaking country in South America: Suriname. No it’s not an island. It sits between British Guyana and French Guyana and borders Brazil. Population is 450,000. For me, the weather is perfect. I am just south of the equator and it is hot all year round. Because of that, I am taking a needed vacation and a break from writing about business. However, I will share my experience in this beautiful country where they hardly ever have natural disasters. As soon as you land here and the airplane door opens, you can smell the jungle. Once again, something I love to smell and explore. Some of my friends describe me as Tarzan in the city. As you all know, New York City is a concrete jungle. So somehow it all works for me. What is best about this trip is my girlfriend is from here. She has been here with her family for a few weeks too long. On this trip, I not only get the joy of a reunion, it happens in a beautiful country with great weather and many new lands to explore. Suriname is part of the Amazon. If you decide to come here, you will be pleasantly surprised at the amount of English that is spoken here even though it is a former Dutch colony. It is one of the most international countries I have seen. There is a huge population of people from Indonesia, India, China, Holland, and Africans that were brought here during slavery. There is also a significant amount of people from the Dominican Republic, Brazil, and Guyana and of course there are the natives that were here before the Europeans arrived. Each nationality has retained its religion and language. What makes it more interesting is they inter marry. The people are beautiful. 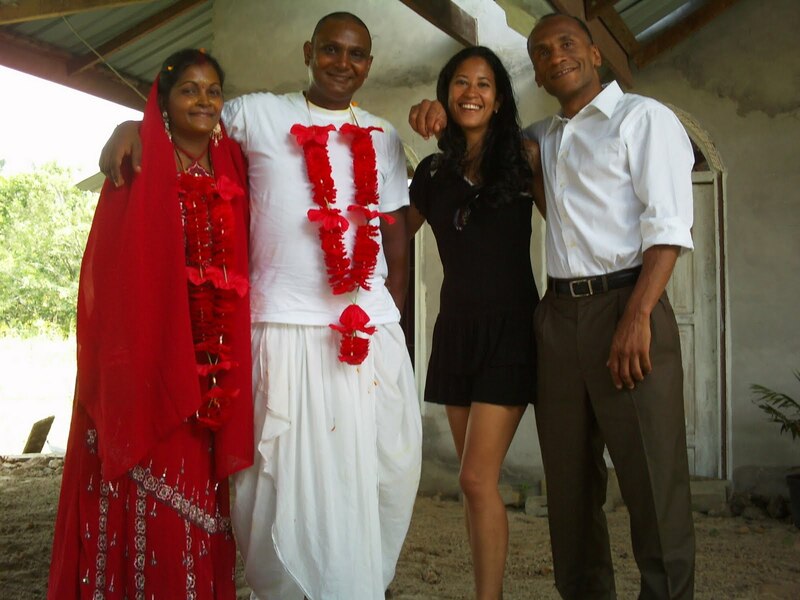 My girlfriend is Chinese, Indonesian and Dominican. She speaks four languages and is well versed in cultures outside of her own. It seems like it is impossible to be born here and speak one language. In general, they see themselves as a Caribbean culture. As far as business, Suriname is filled with opportunity. While Suriname is rich in natural resources, like gold and bauxite – clay from the earth used to make bricks, the Dutch did not build an export industry. Holland, Canada, and the US continue to extract those resources for themselves. There really is no strong manufacturing here. They import almost everything. While I am here to enjoy, there are a number of possibilities I will explore. The culture of business and leadership in general is very different from the US. There are gaps in efficiency here. I will keep you posted. I am here until September 12th. If you have questions about Suriname in the meanwhile or want me to write on a specific topic, connect through the comments.